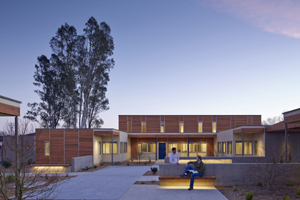 Sweetwater Spectrum, a planned community of four single-story residences and a community center located in Sonoma, CA, is designed to serve adults with autism spectrum disorders. The project was initiated as one of several zero net energy demonstrations and provided the opportunity to evaluate how closely the Sweetwater Spectrum buildings achieved the design goals of attaining zero net energy performance over the course of 12 months, and to compare original modeling estimates to actual monitored data for the occupied buildings. One of the problems in such facilities is efficiently delivering comfort to multiple spaces, which this design has overcome by providing zoned radiant floor heating and cooling and also forced air distribution.